Mobile homes may not always be a good investment. When people are looking for low-cost housing, they may turn to mobile homes as a viable option for their needs. Often, people rationalize these decisions with the fact that the mobile home is an investment, compared with paying rent, and that they believe that it is superior to live in a home that they own, even if it has wheels. 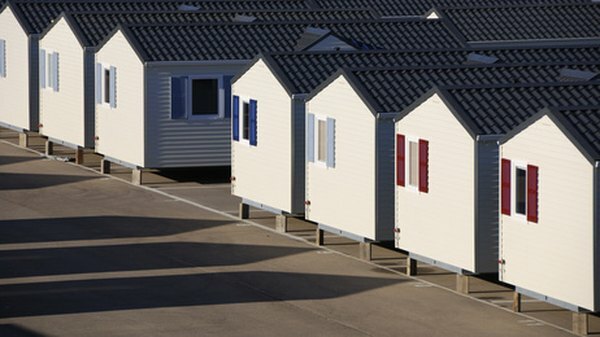 While advantages exist to living in a home of your own, whatever the form, mobile homes have some significant disadvantages when viewed as an investment property. A mobile home works much like a car in terms of an investment. It starts to depreciate at a rapid rate once it is delivered. University of Illinois professor Sonya Salamon and co-author Kathrerine MacTavish report in a study on mobile home owners that the value of a mobile home generally drops to half its original purchase price in as little as three years. This depreciation can quickly turn your home into an expense, and not an investment, and can make living in a mobile home more expensive than living in a comparable-size apartment. In addition, mobile homes are not as "mobile" as their name suggests and can cost as much as several thousand dollars to move, the study says. When investing in residential real estate, people typically prefer their home to have a conventional appearance. Even if it's a double-wide, a mobile home still often looks like a trailer. This affects the resale value. People desiring a traditional home appearance may shy away from a mobile home for this reason. Although new mobile homes are built to standards set by the Housing and Urban Development, people may still perceive that mobile homes are cheaply built when compared to a stick-built home. These factors affect how desirable a mobile home is to a potential investor, and therefore affect the values and appreciation potential of mobile homes. Mobile homes should not be confused with modular homes, which are built in a similar technique to traditional homes. Most modular homes are built to higher standards, and when fully assembled on site, look almost identical to their stick-built counterparts. Modular homes appreciate in the same manner to on-site stick-built homes, and do not have the undesirable investment characteristics of mobile homes. ConsumersUnion.org: Dream Home -- Or Nightmare?